Leftover stock from Black Friday which was previously on sale at £10 but now reduced to £5. There was a few left next to the deli in Colindale Morrisons and as it's a proper ticket it should be nationwide. Cheers mate, heat added. Found about 18 in the Morrison's in Sutton. Damnit - spotted these in Morrisons Downham Market last night but didn't recognise the price drop! Anyway, there were plenty there. But what do you do with so much spicy sausage..? Is this really a deal? 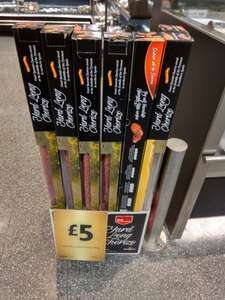 Normal sized ones in Aldi (regular or spicy) are really very cheap (just over a pound I think?) and I think you'd struggle to use this all up in a reasonable period. We use it in stews, spanish chicken, pasta, etc. as it only needs a small amount to add good flavour. anyone know what the quality is like ? Some in Oxted yesterday...But what do you do with so much spicy sausage..? II have a few ideas, but none of them are particularly hygienic.